“Nova-Kool Products will take 4-6 week for delivery. By buying this product you can collect up to 132 Yachtaid Points. Your cart will total 132 points that will be converted into a voucher towards your next purchase! Must be logged in to collect points. Low Voltage Battery Protection, to guard against full battery discharge. Left or Right Door Opening. Designed for Mobile Applications on grades up to 30° angle . Multi Voltage Design 12, 24 VDC. The Novakool units are a best buy in a small refrigerator for off grid power. They’ve been favored in our catalog for over 20 years. Nova Kool offers 26 DC and another 24 AC/DC models. Made to build into RV or marine cabinets, the R4500 cutout is 28.75 high x 20.25 wide and 22 inch outside depth.. Galvanized metal exterior with white ABS door. You can slide paneling or formica, or even use a square of carpet on the door for durability and insulation. Well finished interior with 2 shelves, and vegetable crisper. 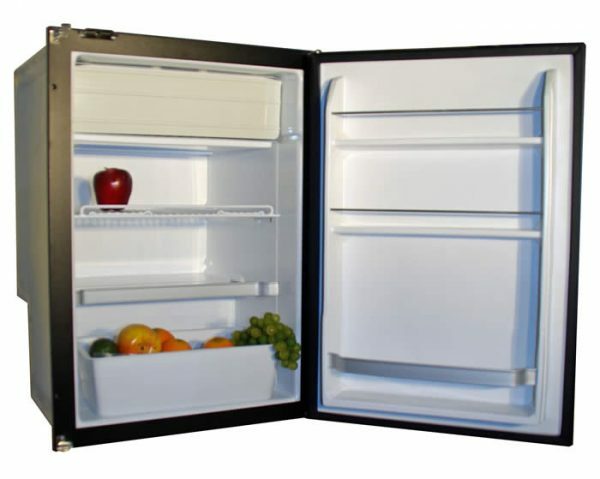 Internal freezer 11″ x 12″ x 5″ high keeps ice cream and makes 2 full size ice cube trays included. One year warranty, two years on parts. Running power has been reduced with new dual voltage Danfoss compressors and a new refrigerant. Single door models consume about 35 watts when compressor is running: under 3 amps 12 volt, 1.5 on 24 volt. Two door models will consume up to 60 watts. Running time varies with temperature, but is about 30% duty cycle on a 70 degree day. Buyer glues extra 2″ foam insulation to the whole box to cut per day run time and power used in half. As supplied the R4500 uses 480 watt hours / day, but with added insulation, just 240 watt hours a day on a 70 degree day. The new Danfoss BD35F compressor uses R134A (CF3-CH2F) gas for atmospheric protection. Interchangeable for use on 12 or 24 volt. Reliable refrigerator.